This recipe was created recently one evening, towards the end of a week from hell. Both of my kids and my husband were sick, we just had family who was visiting leave, so the house was a mess, and I hadn’t meal planned, so I had to fly by the seat of my pants when putting together dinner. I had just a few staples lying around, so I decided to create this easy, yet delicious Green Olive and Lemon Chicken Recipe. And it was absolutely delectable. The perfect amount of tang from the lemons, and just the right saltiness from the olives. Low in carbohydrates and high in protein, it was also very satisfying. I was lazy and didn’t halve my olives, but I suggest doing that so that the olive flavor can be more evenly distributed. It was so good, and so easy, it’ll definitely be added into my regular meal rotation. Enjoy! 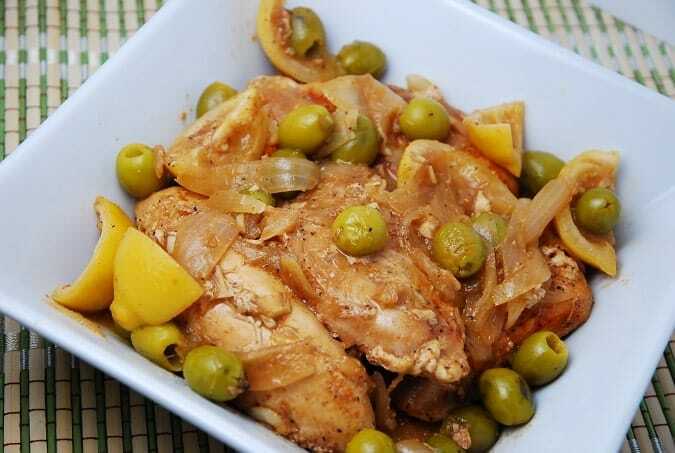 Succulent, seasoned chicken cooked in a delicious, lemony sauce and accentuated with green olives. This easy Weight Watchers Chicken Recipe is a delicious ad reliable meal that is filling and flavorful. Heat a large, skillet over medium high heat. When pan is hot add olive oil. Season chicken breasts generously with salt and pepper. Place in pan, and sear until golden brown, about 3-4 minutes on each side. Remove chicken and set aside. Add onions and garlic to the pan, and sauté, stirring often, until tender, about 2-3 minutes. Add splashes of the chicken stock as needed to keep the onions from sticking to the pan. Now add in the lemon, olives, paprika, cumin, and remaining stock. Bring to a boil, and let simmer about 10 minutes. Add in the chicken, turn the heat to medium low, cover, and let cook until chicken is tender and cooked through, about 30 minutes. What do you think about putting that in a slow cooker? This looks amazing; you’re awfully good at winging it!